Those zany billionaire brothers, Charles and David Koch never let up on their attacks against transparent democracy. Their latest assault on truth, an anti-corruption measure (Measure 22 or IM-22) to be voted on in South Dakota's upcoming elections, is par for the course. 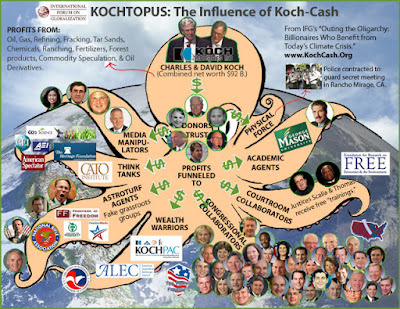 The last thing the Koch boys want is transparency in elections. Both are believers in "dark money" and other nefarious ways to rig elections. The state-wide initiative was launched by a bipartisan group called the South Dakotans for Integrity. If passed, South Dakota voters may finally have some way of knowing who is bankrolling those big money ads before an election. But not if the Koch's get their way. They've gathered a dark empire of billionaires and millionaires intent on controlling the country. I'm not a conspiracist. I don't think Climate Change is a Chinese plot. I believe president Obama was born in the United States. What I'm sharing with you are facts about how the Koch brothers and other wealthy elite types are subverting democracy and the common man's best interests. Remember, knowledge is power. By shining the light of truth upon the Koch brothers and their cronies, you send them scurrying into the shadows.